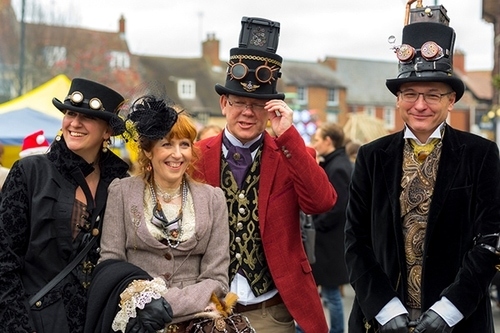 On Sunday 8th December 2019 from 10:00am until 4:00pm, Dickens of a Christmas brings a taste of Victorian England to Olney. This very popular event attracts many visitors to enjoy the sense of days gone by. Stall holders dress in costume of the era, selling all manner of merchandise, filling the town from the Market Place and the length of the High Street, offering many opportunities to purchase Christmas presents as well as supporting local charities. Craft fairs can be found in The Olney Centre and library and The Carlton House Club. Enjoy the old fashioned fair, street organ entertainers, singers and the Olney Brass Band. A park and ride service is available from Emberton Park and the Yardley Road Industrial Estate.